Railroads rely heavily on cable maintenance to keep the trains running. Signal cables, as well as other types in critical functions, are subjected to considerably more stress than are cables in more tranquil environments. Heavy-duty rail yards, highway crossings, public access areas, industrial feeder lines, and so on, make up a patchwork of varied environments that contribute heavily to wear and tear. 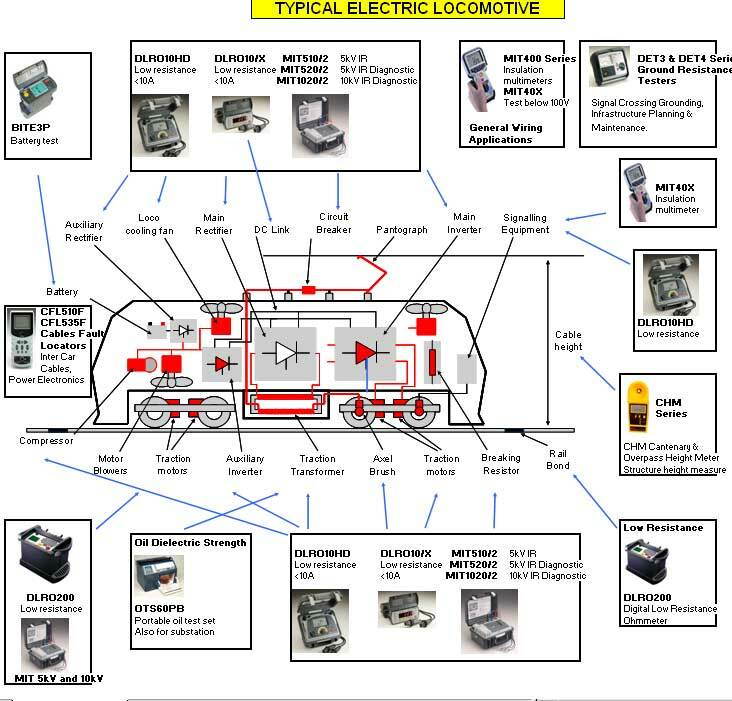 Accordingly, railroads have commonly learned the value of the preventive maintenance concept. With schedules to be met and traffic crossings to be kept clear and safe, reactive maintenance after a breakdown is virtually out of the question in critical functions. Cables are tested on a regular maintenance schedule that includes insulation testing. Commonly employed acceptance values for signal cables are 200,000 and 500,000 Ohms. If the cable tests above 500,000 W (0.5 MW), it is passed. If between 500,000 and 200,000 W (0.2 MW), it is earmarked for a more dedicated test schedule (typically, every 12 months). If below 200,000 W, it is pulled and replaced immediately. Obviously, Megger Insulation Testers are the instrument of choice for this application. The wide variety of models that will meet this fairly general requirement enable the prospective customer to satisfy both budget restraints and personal preferences on a number of additional functions. The cables involved are generally 600 V, so that the operator can readily choose between a 500 V “operational” type of test or a 1000 V “stress” test. Since most models offer both of these test voltages, this is an easy match. The pass / fail range is also readily met, but just be careful to keep the customer apprised of the units of measurement in which they will be working: one half, and two tenths, of a MegOhm. On Major Meggers, the analog scale shows divisions at the required values: 0.5 is marked as such, and 0.2, while not specifically noted, is the next “tick” mark above 0.1. These are both readily distinguishable in terms of pointer travel. The digital model (210600) will display the desired values as 0.20 and 0.50. Hand-held models also provide the correct divisions, essentially the same as do the Majors, whether digital or analog. And while 5 kV models may represent overkill in terms of test voltage, the MJ15 & BM15 models do offer the plastic overlay accessory that can be conveniently marked with the desired pass/fail values to help reduce the possibility of operator error in interpreting and recording results. It should be noted, however, that with these models, the amount of pointer travel in the desired range is reduced compared to that of Majors, because of their overall greater measuring range. This entry was posted in Megger. Bookmark the permalink.